National Health Programme was organised in village ghanour which is covering whole punjab. In the intensive diarrhea control fortnight, a Behavior Change communication event was organized for the mothers, ASHA workers and health personnel of Mata Kaushayla Hospital, Patiala by the students of GNM III year. 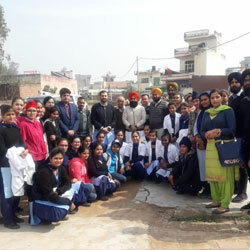 The event was coordinated by the community health nursing department and pediatric department under the guidance of Principal Dr. Surinder Jaspal and Dr. Neerja Shukla. The special guest for the event was Dr. Bhag Singh, Senior Medical Officer, Mata Kaushayla Hospital. The event was organized from 10 am - 12 noon in the conference room of the hospital. During the event, the diarrhea management, symptoms recognition, ORS Preparation and importance of ORS and Zinc combination therapy was emphasized in the management of diarrhea. Health education materials in form of charts, flow charts, and pamphlets were displayed and distributed. The event concluded with vote of thanks to the special guest and all the invitee participants. Efforts of the students were applauded by the medical officer. To embark and highlight the importance of breastfeeding i.e. 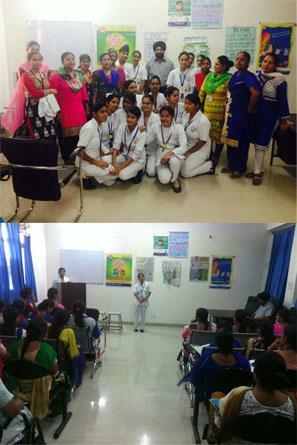 (1 August -7th August), Swift Institute of Nursing organized an awareness event at AP Jain Hospital, Rajpura. Students of GNM I year under the guidance of teachers organized this event. During the week, different aspects of breastfeeding-importance, expression, methods, kangaroo mother care, and expressed breast milk were emphasized. Health education materials i.e. chart, and pamphlets were displayed, and group of antenatal and postnatal mothers were gathered and education was given. During the session, queries of the mothers were answered and proper technique of the breastfeeding was also demonstrated. Recent techniques i.e. breast crawl and KMC were also highlighted. The efforts of the organization were applauded by the Medical Superintendent.